I used Lice – Solve last night on my happy active fish and this morning 16 of my fish are dead leaving only 5 left alive. I am heartbroken that despite using the correct amount and following instructions to the letter that I have inadvertently killed my beautiful fish with this product. Hello, I have an American freshwater eel that I bought at a Maryland bait shop about 5 years ago. Although shy, he has been doing well. Just the other day I brought home a dozen comets to feed him, and only noticed a day later that one of the feeders had fish lice. (lots of Google searching there) I got out 3, 1 swimming and 2 on the feeder, but found a line of what looked like eggs that I was unsuccessful at removing. ( they swirled away. oops.) I am worried what I can use to treat the tank with that would be safe for my eel. Or if goldfish lice can even spread to an eel? I think copper is supposed to be bad? <Copper is toxic to virtually all life; it's really a question of how much. And a salt soak would not clear out the rest of the tank. Research has not given me much as most people have marine eels or spiny eels. Greetings, I bought three new juvenile fancy goldfish (a Ryukin, a fantail and a black moor), each around 2 inches long (not including the tail), three days ago. They are currently in a 20-gallon quarantine tank. The water parameters are ammonia & nitrites = 0 and nitrates = 20. The temp is 72 degrees F and the pH is 7.4. All three fish are lively, eat well, and appear quite healthy. I noticed this morning that one of them had what looked like a fish louse on his tail. So, I picked them off with tweezers and upon looking at the creatures under a microscope, it appears to me that they definitely are fish lice. Our local pet store suggests using PraziPro in order to be certain that all life stages of the lice are killed. Some others say that PraziPro is only for internal parasites. I have never dealt with fish lice before. What would you do if there were your fish? Thanks very much in advance for your answer. and the linked FAQs files above. Thanks so much for the information. This is a wonderful website and many times I've found helpful info here. I guess I misjudged you. I care tremendously about my fishes' health and I did read that links you suggested. But some of the products you have in the UK are not available to us here. Many people have had success with the product that I mentioned. Sorry to have bothered you. <Not a bother.... READ and locate the useful molecules listed on WWM. You may need the help of a veterinarian there. OK. But I did not just come back with the same treatment I previously suggested. API's treatment has different ingredients than the one I first mentioned and our vet says that he has had success using them for lice. so I'm sure we can figure out the chemistry together. We shall read your link again and think over it some more. Thanks again. Hi, I was sincerely hoping you may be able to advise me. I have a 28 gallon tank (set up 4 weeks ago) which cycled fully after 2 weeks (highly improbable I know but the water tests I have had done every few days - samples taken to LFS for testing have consistently shown 0 ammonia, 0 nitrites, low levels of nitrates after the initial ammonia spike in the first week). I have many plants and a log from an established tank which kick-started the whole thing beautifully. I added 2 fantail goldfish after a few days of setting up the tank and things were wonderful for one goldfish, the other quite quickly seemed to get stressed, fins clamped, sitting at the bottom of the tank and only stirring when food was served (flakes, occasional peas, broccoli, and bloodworms). (I could see eggs on the plant leaves). I fear though that I may have slightly overdosed my tank (by a small amount - my scales aren't as accurate as I needed them to be). The fish was fine that evening but in the morning he had his nose down in the plants and wasn't moving much. I quickly changed out 30% of the water and he perked up, hungrily eating his flakes and swam around for about 3 hours as usual. Then he settled nose down in the plants again and has stayed more or less in the same spot ever since. I did a further 30% water change in the afternoon. He has tried swimming but seems too weak to fight the current in the tank. I tried to tempt him into some activity with the bloodworm with no success. My question is: is there anything more I can do to try and help him? If he does die, will I have to clean out the whole tank, buy a new cartridge for the filter and start the cycling process again, or will several large water changes remove the offending chemicals from my tank so I can get a new fish and hopefully have better luck/success? , but I have done a water test before cleaning the tank out and the lice-solve had caused a massive Ammonia and Nitrite spike which killed the fish. All I can say is, anyone thinking of using lice-solve for their tanks, use extreme caution, use literally a couple of grains of the powder, and keep a very close eye on your ammonia/nitrites. I wouldn't recommend the stuff myself. Question: what is a good sensible alternative treatment for fish lice should I ever encounter them again? First off, thank you for your site. I have used it and have learned much on more than one occasion. My question is about Argulus (fish lice). About two months ago I discovered Argulus on some of my goldfish. After much research I learned about Dimilin and tracked some down at an LFS about an hour from my home. I removed all of the many mystery snails living in the tank and treated it for the prescribed time and it worked wonderfully. All is well with the goldfish now. but they are still visible all over the glass in the snail tank after over a month and a half. Are snails a host for Argulus as well? If so, is there any way to kill them without harming the snails? I really want to move them back to their big 50 gallon tank where they can move around doing their happy snail-speed things. I have a 175 gallon salt water tank, I have a 500 gallon turtle pond and I have a 5000 gallon Koi pond. I CANNOT believe I was so stupid as to NOT QT. So my problem, the 5000 gallon Koi pond, I have had for 5 to 6 years. Its beautiful. Well, a couple of months ago I did a rescue, some Chinese restaurant had over 100 Koi in this LITTLE pond more suited for maybe 20. So we did a rescue of 4 of them (along with a few other folks) and I didn't QT, the Koi. Now, I have fish lice on all my beautiful butterfly Koi. I cried, literally. So here's what I have done, I removed all plant life, did a HUGE water change, cleaned the bottom, and treated them with cyropro. 1) Am I going to lose any of my fish? they are all named, blinky, ceech and chong, nessie, etc., my butterflies are like 22 inches long, I am SO mad at myself I KNOW BETTER. 2) How does this cyropro work? Will the lice fall off them or do I have to manually remove them? And how long does it take. States to treat every 10 days for 30 days. 3) Is there anything else I can do to speed up the process? I hate seeing my fish uncomfortable. They are not even coming up to me for their hand fed treats! So sad. 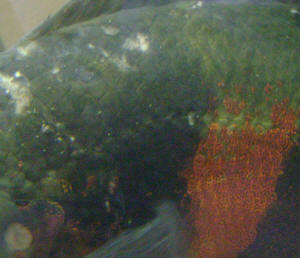 Believe it or not I have searched the web over and over again on fish lice, there is not as much info as I would like! Things like how long before you notice an improvement. Will they come back? The active ingredient in this med is cyromazine, Google says it is a pesticide. There is also B12 in the product and a synthetic skin-slime replacer. This is what our LFS recommended. We used last night (the first treatment) 1 fluid ounce for 312 gallons, so we measured it out and we walked around the edge of the pond pouring it in. It doesn't state that we have to manually remove the lice. How do I do this without stressing my fish too much? When you said to manually remove them I did a search and read that once the lice is removed I should treat the spot with a medication to aid in healing? Yet the site didn't say..what kind of medication! I read the link you sent, actually I read it last night and again this morning, which is how I ended up emailing you. PS, I can pull my fish out and put them in a 500 gallon QT tank that I have on hand. Would it be better to do this and leave the main pond alone? into the fish world I've taken. However, currently I've run across something that I can't quite get a grasp of to fix and would like your input. I've had these 2 Oscars in a 75 gallon tank for the last 5 years and have normally been very active and playful and decorative for a lack of better term. (Thank tank never keeps its current layout very long they change it almost monthly it seems) Lately though they've been a bit lazy and dont swim around as much. They still have an appetite and are very energetic when its feeding time though! The problem is that they started rubbing on things and it got to a point to where they would rub gouges in their scales on their head and front areas. One night I finally got a closer look at them and they have these little specs all over them, and at first I thought it may just have been some sort of dirt but as I looked closer I noticed the dirt specs crawled around. So I looked around at your website and searched around for pictures of the only thing I could guess it was based on symptoms (fish lice) and couldn't see many pictures that matched it. I read a few of your email answers about fish lice in fresh water and have started a treatment of clout tablets. Its only been 2 days and it says its a 4 day treatment (one dose wait 48 hours re dose, wait 48 hours and do a 25% water change). I followed those instructions and my re dose is later today and I thought that maybe the little bug things (fish lice?) should be dying by now! The parasites are less in number but still seem to be hanging on the Oscars. The other concern is that I didn't think they may be fish lice just because all the stories I read about them, was them burrowing under the scales and these look more like little spider things on top of the scales just randomly crawling around. They're staying mostly towards the front of the fish there are few if any past the gills of the fish and most are on the head. I've attached a couple of pictures that I hope can help you aid me in telling me what they are. Here are my current tank stats if I manage to leave something out please ask if you need it and I'll get it ASAP. I just ran these tests 5 min ago. pH: between 7.4-7.8 Its probably higher than you guys would like to see but its kind of the water card that I've been dealt and the Oscars have lived in it for 5 years now with no problems thus far. I also am not sure if the phosphate level is normal or acceptable because there's little reference to a normal level of phosphate in a tank. The pictures look a little bit drastic because of the massive amount of the parasites on the fish, but a lot of them are just loosely on there as soon as I feed them or come towards the tank any remotely fast movement shakes most of them off. I had to sit there very patiently for 10 minutes to get the fish to calm down enough to get these shots. 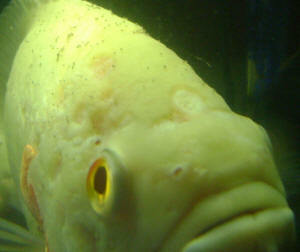 The albino Oscar always has more of the infestation on it than the tiger Oscar does and I also don't know why that is. Anyhow, sorry for the long email but I would greatly appreciate any help. If the clout treatment is the correct way to go then it's already in progress and I suppose I'm just not patient enough to wait for the results!